Tiny, giant, semi-buried models of undead lizards, possibly from space, perhaps from a dark age in the future. It has recently been discovered that dinosaurs, a form of monster from several hundred years in the past, consisted largely of bones, just like you, me and the mighty oak. 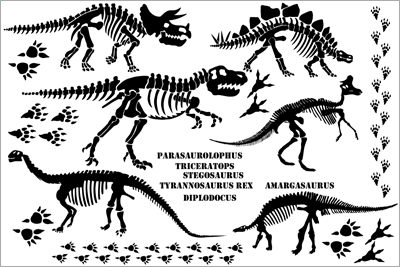 Artists Impression of dinosaur x-rays four hundred years ago. Previously regarded as mythological – like leprechauns and seahorses – the scientific discovery that these mighty undead creatures came to Earth on a comet from the moon has led to a developing market in dinosaur bones, causing outcry from preservationalisters. 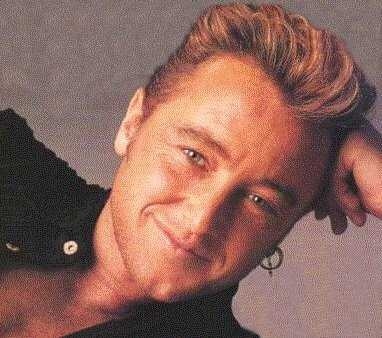 Michael Flatley: Preservationist Rating: ZERO. The audition queue for “The Dinosaur Centipede” seemed never ending..
Prime mover in contraband sales is the fortunately named “Dinosaur Corporation“. Although neither DinoCorps CEO “Randy Dinosaur” nor its representatives would comment on the issue, it was this organisation that provided some of the corpses that have been used in our reconstructions. Other undead moon lizard bodies were made available in Lidl for a short time. 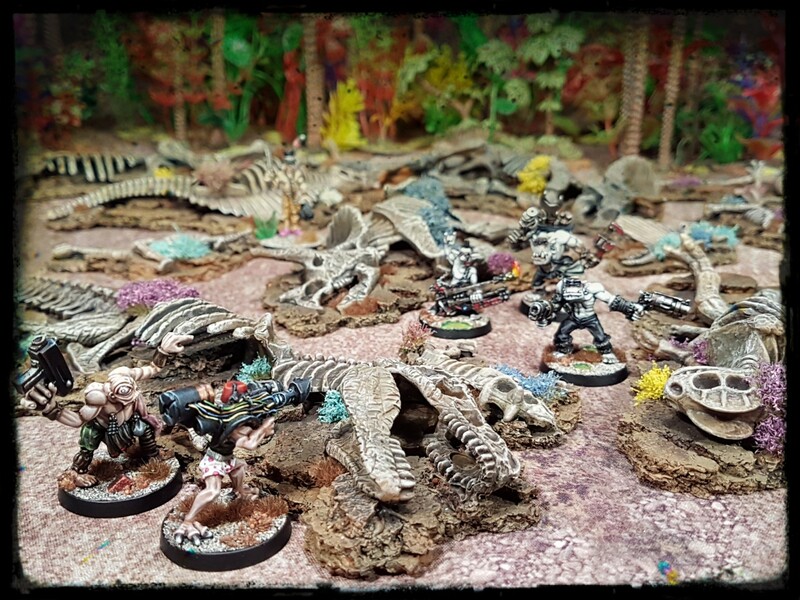 Conveniently for tabletop miniature wargamers, of which I am, these gigantic, tiny beasts bodies are well suited to use in wargame terrain, once their remains have been smuggled to Michael Flatleys house, at which point he disseminates them to unscrupulous miniature gamers, of which I am one. In addition to the obvious use in games like “Dinoproof”, dinosaurs have a rich history of appearance in sci-fi media. 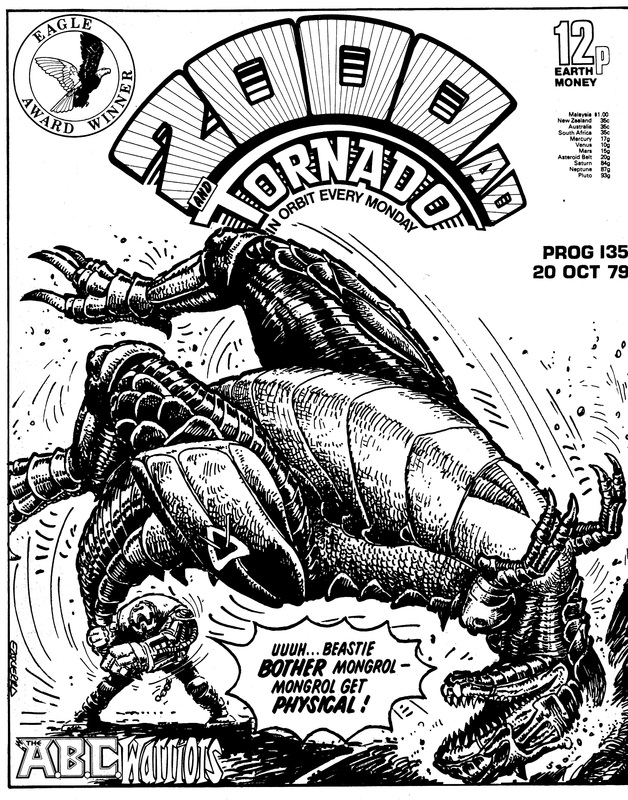 The Cursed Earth – the radioactive wasteland that covers 80% of North America in Judge Dredds world (but is thankfully several weeks away in real life) is full of dinosaurs and dino bones. 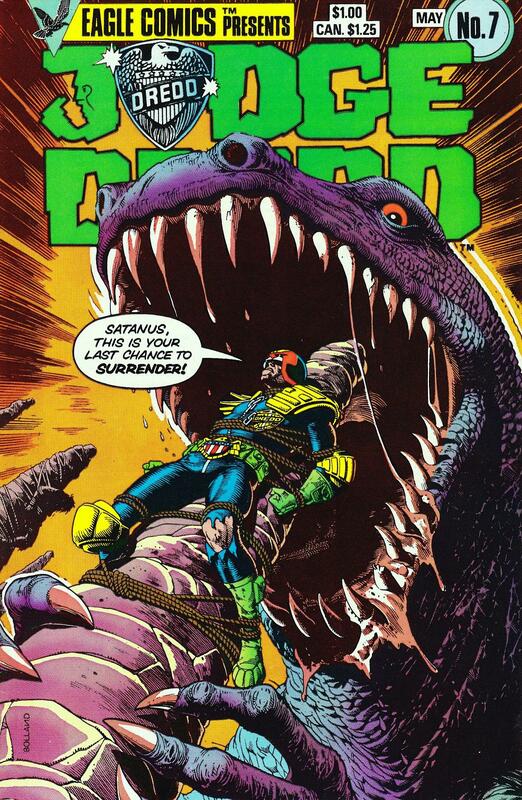 Dino skeletons are therefore totes Cursed Earth legit. The ABC Warriors have spent some time in the company of dinosaurs too. 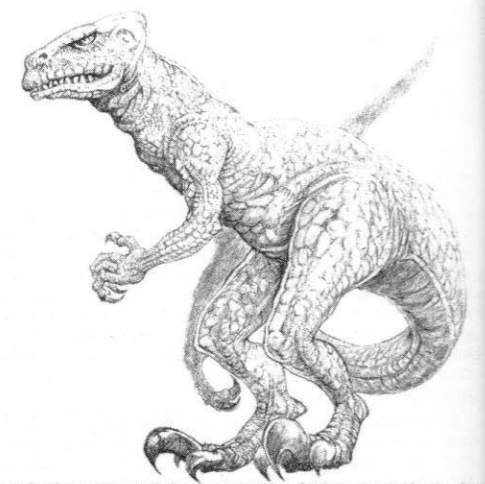 Lastly, as if the existence of sci-fi gaming dinosaurs required further validation (it does not) the above picture from the section on dinosaurs in the Warhammer 40,000 Rogue Trader rulebook should put any doubts to rest. Nice scatter terrain there, Cheetor! I want me some of those Lidl ones! 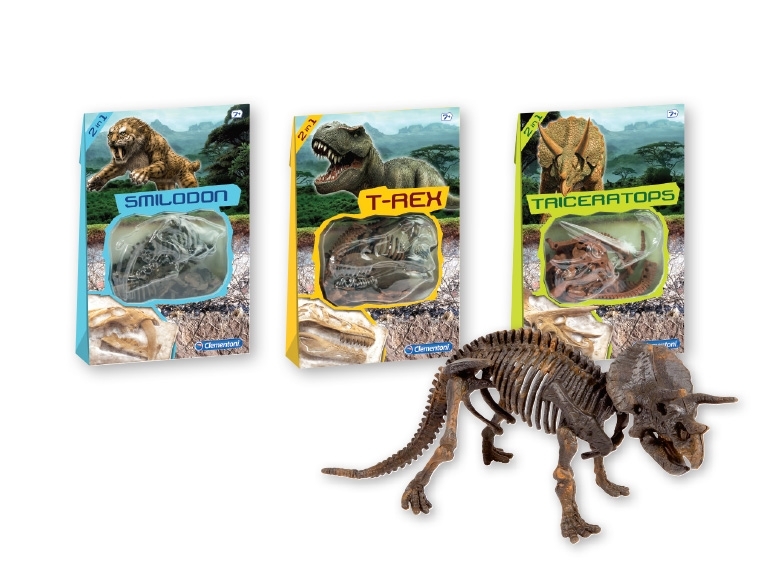 I had the cheaper dino skeletons for about ten years before I did anything with them. Then with the release of Dinoproof a few of us committed to a game at a convention and I decided that it was time to get the dino bones done one way or another. A trip to Lidl a couple if days later and the t-rex and triceratops kits were sitting there, smiling liplessly in a serendipitous way. Do you have Lidl in Australia Azazel? I dontbthink that the kits were specific Lidl brand anyway though. Lidl here has patterns. Musical instruments annually on week X, fitness bits and pieces on weeks Y and Z.
Dino skeletons were part of a arts and crafts and hobby theme I think. The t-rex and triceratops skeletons accent the plainer Dino Corp items nicely, dragging the entire set up by it’s bootstraps. This post in its entirety made me happy. To this idea…twelve points from Finland! How easy would the dino hunting game be to adapt to this? Pretty easily. Depending on how effective you regard Hollywood firearms to be, they will slot right in. Do I hear pirates + ninjas + dinosaurs? I don’t think that these lizard corpses would fit into your creepy, dark fairy-tale forest Alex, but they are atmospheric in in different way I think. Miniatures are no good without atmospheric surroundings I think. The remains of large mammals makes more sense to me in that context. Predatory felines, canines and ursines… maybe some large insects and arachnids. At least, that’s how I would approach it. You have the chops to make either work anyway Alex. This post was the perfect start to my Friday. Bravo cheetor, you’ve thrown the lid off this controversial issue and delved deep into the mummified remains of it’s guts. What further mysteries will be discovered? We’re all waiting with baited breath (no pressure). There’s likely a Nobel prize on the line here (no pressure). Mankind’s fate is in the balance (no pressure). I refused to be silenced Captain! The Bilderburg Group can’t keep the truth from the people forever! 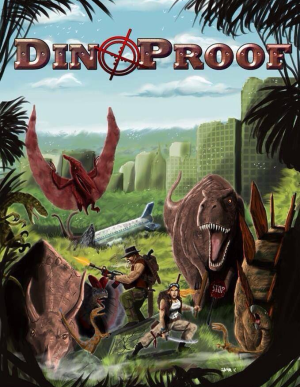 Dinoproof – and your wonderful historical-revisionism mash-ups – has itself a brand new fan! I like what you’re doing with this project…. I’m glad that this flavour of toy soldier enthusiasm appeals Cartoonist-at-Large! The dino remains will show up in a variety of games I reckon. I straight up love these. Though I am always on the lookout for wargaming fodder in Lidl, DIY stores, pet shops, hedges, the beach… well, everywhere it seems, I missed these. You done good son. This morning I spotted that a local discount store is under new management. I will have to check it out in case it has… something that I always wanted but was unaware of. It’s almost a compulsion. I hit a good stride working on these. I tried some new approaches to painting them that worked out well. I’ll add a couple of photos of the pricess to the post: you might find them interesting. It occurs to me that with judicious application of glue-soaked tissue paper to these skeletons you could make partially mummified or decomposing dinosaurs too. It’d probably look really cool. Adding skin is a good idea Allison, it would give a good Indiana Jones sort of vibe. As you say, I think that these will be pretty versatile terrain pieces. Hmm several of those models reside in my undead army, where they fill the possie of big gnarly critters quite nicely. Thank you Brendan, I’m glad that you like it. 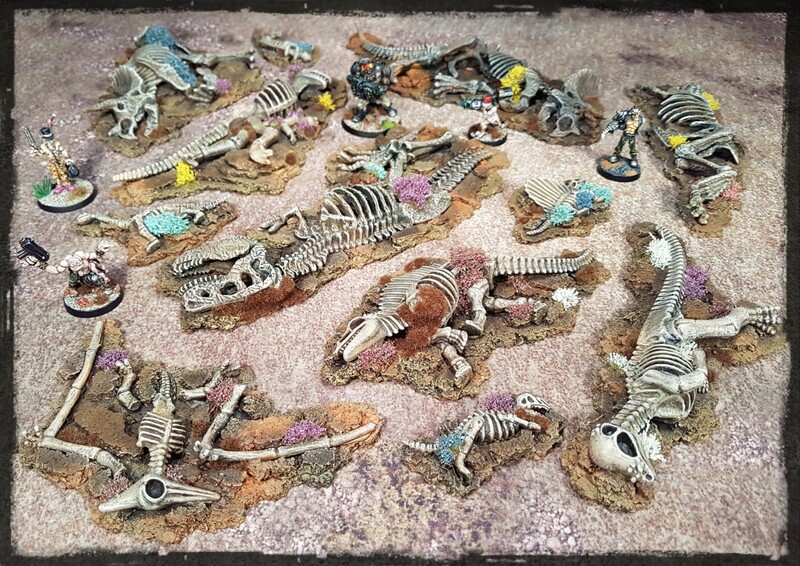 I heartily approve of an undead dinosaur contingent in an unread army.